Recently became a Docent for the Irvine Ranch Conservancy in SoCal! My book Fur Shui came along with me through the environmental class and enjoyed the great out of doors picnic with all my new docent friends (Thank you Brian...our fearless leader and teacher!). Chi is everywhere, get out into nature, be silent, hear, feel, touch, and see the beauty that naturally flows in our protected sanctuaries. It's up to you and me to enjoy, preserve, and protect, these beautiful places where nature can "be", where we can learn how to flow and grow with it. 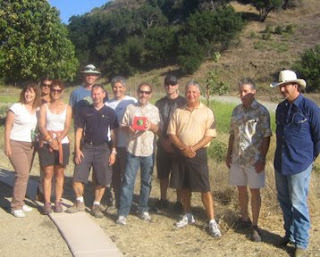 Congrats to all new Docents at the Ranch and everywhere helping folks feel from their heart the power and peace of nature! Another fan of Roy's is his cat Tigger who does in real life have the curiosity of the Winnie the Pooh character for sure. 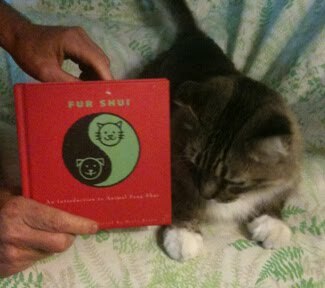 Tigger is curious about the book, and has his own agenda with energy in their home. He is nestled into a fern green soft bed, green being the color of family and community. Roy has a wonderful family of fur and feathered folks to watch over, no wonder there is soft ferns and greens all about making life comfortable for family and sharing. Wear green for best wishes for family harmony. How about a nice green soft collar for Tigger?! 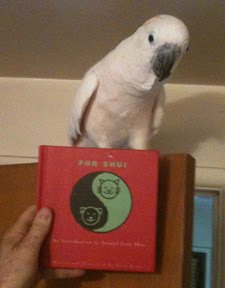 Thanks Roy for sharing Fur Shui with your family. For Roy's bird Marilyn, you have to be "on top" of the world when you look at the energies around your home. Marilyn perches up to supervise all things Fur Shui! She is the color white, which is the color of the children and creativity gua. She certainly has Roy doing creative things to show her the book. Keeping Roy on his toes and looking at the upside of things is a very good creative way of helping her person!